Interior design is always fun to do, but since it involves making your home nice, some people rein in their creativity in order to keep their space looking appealing, professional, and most of all, adult. 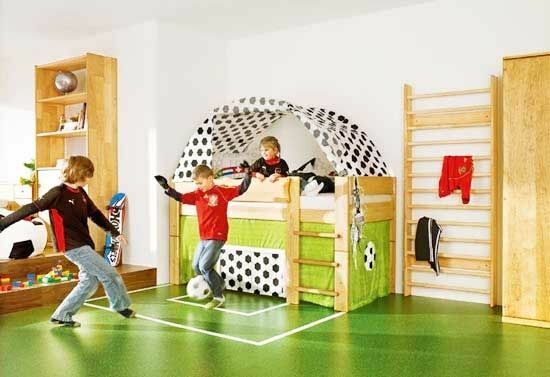 However, when it comes to kid’s rooms, we can go to the opposite end of the decorating spectrum. Anything crazy and colorful is encouraged. Why? Because parents- rookie or veteran- want to create a space for their children that will make their imagination come alive. A space that looks like the jungle when the stars come out at night. A space we still secretly yearn for. So, how does one accomplish this? Well, I’m glad you asked. 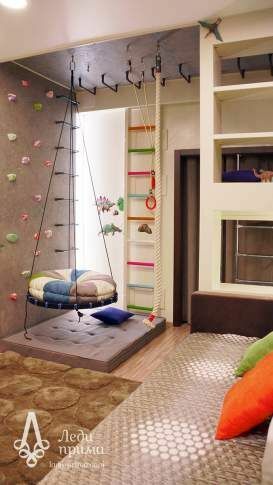 Here is a list of inventive kids room DIY ideas that will blow your mind, and make you wish you were a kid all over again. 1.15 15. Magnets: This Trend’s Sure to Stick! 1.19 19. LEGO Wall: Everything is Awesome! 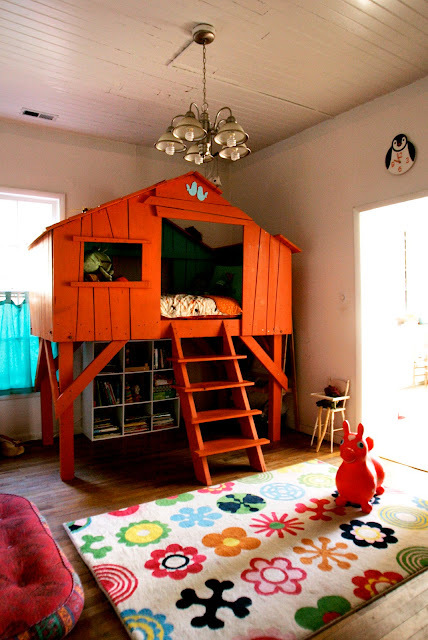 You know those playhouses we had outside when we were kids? Well, now you can have it inside! Say goodbye to the cliche Fisher-Price extra large plastic look, design the little house any way you want without having to worry if it will get ruined when wet. These are the ultimate addition to any child’s bedroom. In the two bedrooms I lived in growing up, both had loft beds and it was awesome. Not only do you feel taller and more powerful, but the storage underneath is a priceless commodity. When it comes to lofts, the best part is that you can design them any way you want! This idea just plain magical and will have kids and adults staring in awe. Kids get to have a real tree house, only inside, so no muddy footprints or icky bugs! This amazing mural realism idea is delightful. I think the swing coming down from the tree “limb” is the cherry on top. Kids have a lot of energy sometimes; ok, most of the time. It can be easier to handle when you can toss them outside and tell them to go play. But if it’s raining or you live in an apartment, your options are much more limited. Instead of ripping your hair out, grab some power tools instead and build them a mini indoor jungle gym where they can (hopefully) exhaust themselves to your heart’s content. We all know how beneficial reading is to adults and kids alike, but bookshelves can be bulky. They are difficult to find space for, especially if you don’t have a lot of it. These skinny bookshelves are an inventive new way to store books and save so much space! What better way to encourage (or discourage, depending on how you look at it) your child to draw on the wall? We’ve all seen those cliche accidents with the sharpies on the expensive wallpaper. Now you can live terror-free of having your glossy coat of paint ruined by oily crayons. Using chalkboard paint you can turn your kid’s bedroom into one giant coloring book. When I was a kid in the 90’s, I had some glow in the dark star stickers that I stuck to my ceiling. I loved looking at them at night, but sadly after a few years they stopped working. Now, in the 21st century, you can give your kids something you never had; fiber optics. These amazing little lights will turn any ordinary room into a magical place when the lights go out. Stars are pretty cool, but if you’re a decorator on a budget, there are some pretty sweet ways to light up your kid’s room at night. The best part is they’ll totally love it. These amazing globe lights can match with any decor and can be done however you prefer. A new trend for decorating any room of the house are wall decals. They come in all shapes, sizes and colors. 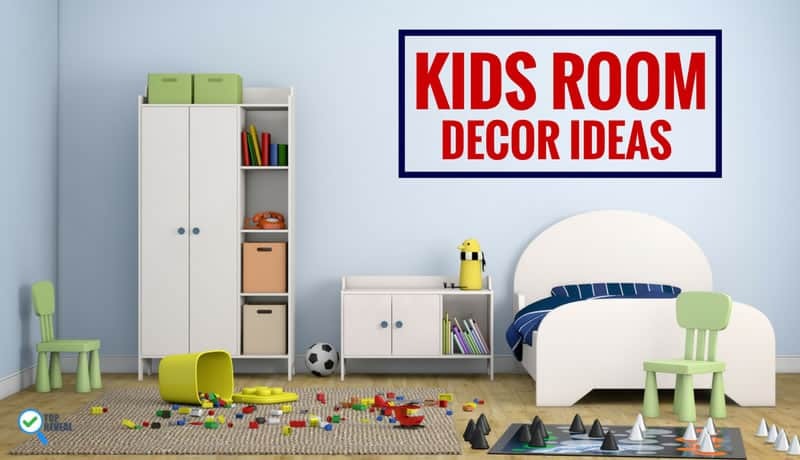 In the living room, you may have to put some tasteful design, but when it comes to decorating rooms for kids, you can let your imagination run rampant. This cute whale is just a taste of the possibilities that exist when it comes to putting huge stickers on the wall. I feel like pillows an essential to any space that will harbor children for the simple fact that it will protect them should they fall. Which is kind of a lot. I’ve seen many cool designs: clouds, moons, unicorns, even balloon animal pillows. But this is the first time I have come across giant rock pillows, and due to their size and different shapes, these are definitely my favorite; not just for playing with, but for sleeping on as well. Naptime and bedtime are the two hardest times for kids and their parents. When you have a fun bed though, that could seriously change things. 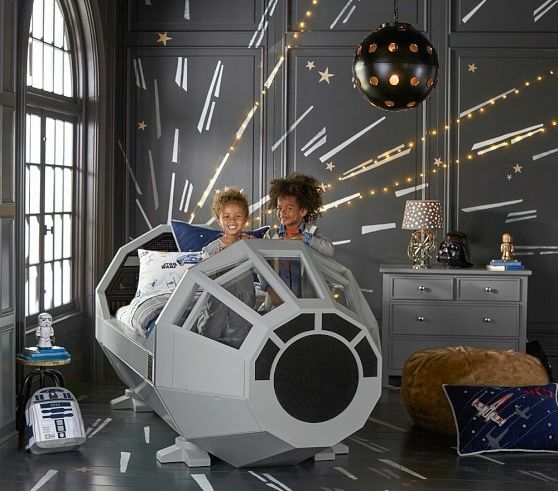 For example, now that Star Wars is part of the Disney franchise, what fan wouldn’t want this amazing bed? Now your kids will race to naptime so they can dream about defeating Darth Vader. When it comes to children, anything plain can be made into something fun and adorable. This bunny chair is no different. Sure you could leave it as a chair and your child would use it, but where’s the fun in that? Make simple objects like chairs and desks into animals or whatever your childlike creativity can muster up. These are the perfect idea for many different things. Play tents have grown super popular, and with good reason. As fun as forts are to build, they eventually always have to come down. But not this one! This closed in space can serve as a permanent fort, reading nook, or tea party room. 15. Magnets: This Trend’s Sure to Stick! Earlier I mentioned how great a chalkboard wall would be. Something that is equally as fantastic is an entire magnet wall. 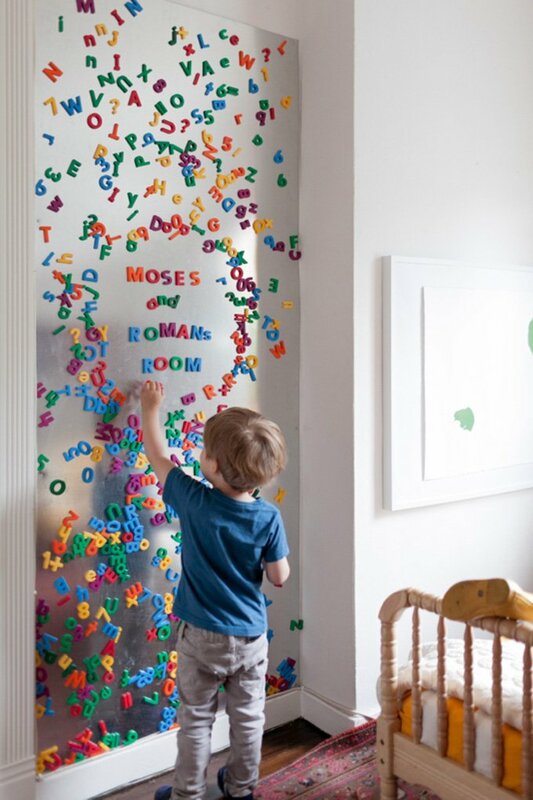 Not only can kids use it to learn, as pictured here, but when they grow up, it can be used instead of a corkboard wall. Never worry about your kids losing sharp push pins again. Give them some neat magnets instead. Every child has chores to do, and yours are no different. But now you can make it a little more fun. 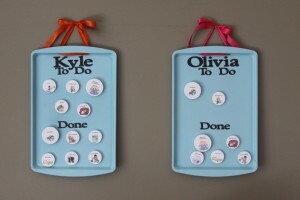 Use this magnetic chore chart idea to keep track of who does what and if it was done already. Easy to make and fun to use, this seems like a must to me. Does your child like to dress up? Then this is the perfect solution for you. Not only does it keep these exclusive outfits easy to access, most importantly it keeps them organized. Which as we all know, is so difficult when it comes to kids. Now you can keep the clothing, shoes, and accessories all in one place. 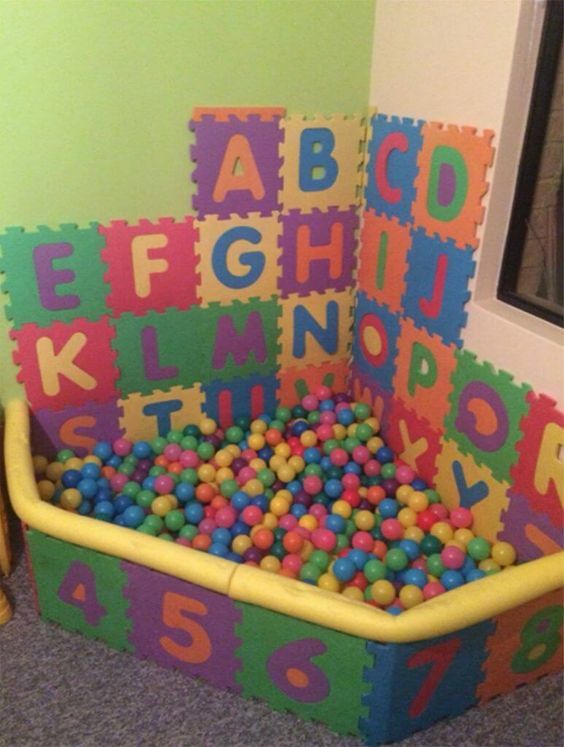 Ball pits are entertaining at any age, and now you can bring the fun right into your child’s room by building them their own personal ball pit. I love the way safety was creatively incorporated as well. Just another way to bring the playground home with you! It’s a kindly reminder to use home steaming machine or handheld carpet-cleaner to sanitize your kids rooms. 19. LEGO Wall: Everything is Awesome! 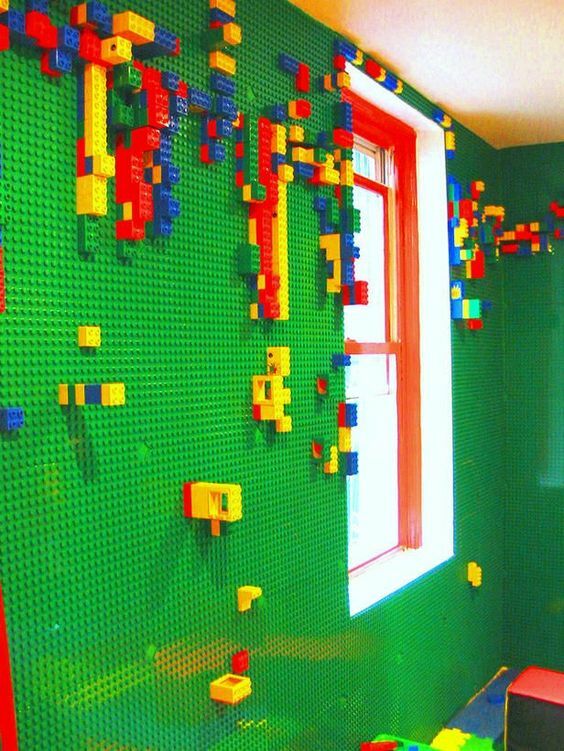 What, I ask you, could be better than having a LEGO wall in your room? The answer; not a whole lot. Anything is possible with this marvelous idea. Your kids will be entertained for hours while they build to their heart’s content. My only warning is to watch where you walk! If your kids like sports, then they need this, plain and simple. It doesn’t have to be soccer, it could be a baseball diamond or a tennis court. Whatever it is, it’s the perfect way for your kids to let off some steam and even practice their favorite sport. Remember to keep it clean with this appliance regularly. 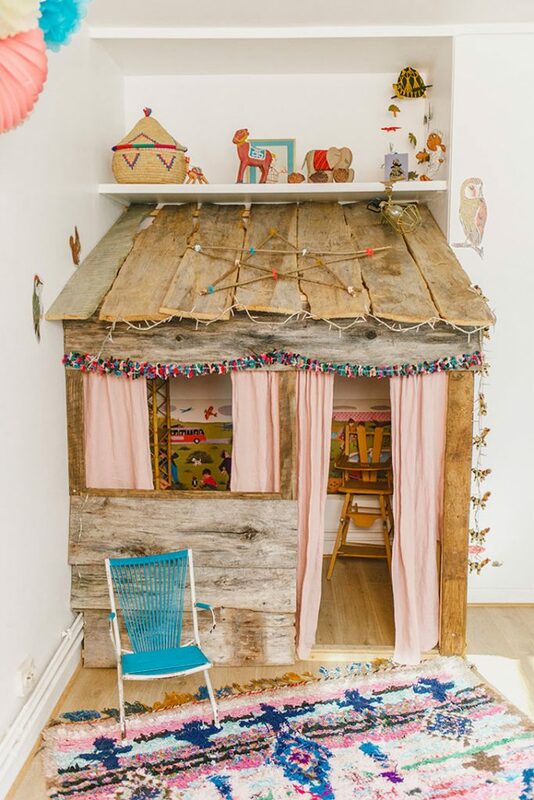 So did you enjoy this list of inventive kids room DIY ideas? I hope you got some great ideas if you already have a couple children, or are looking to start. Being kids once, we know how amazing it would have been to have incredible things like these growing up. Let your imagination run wild as your child’s’ is sure to do. If you liked any or all of these ideas, please let us know! Comment or share this list so kids everywhere can get the wonderful room they deserve.